One of my favourite things in the world to can is fruit butters, which are basically fruit that has been cooked, blended, and then boiled down to reduce the moisture content until the end result is smooth and spreadable. 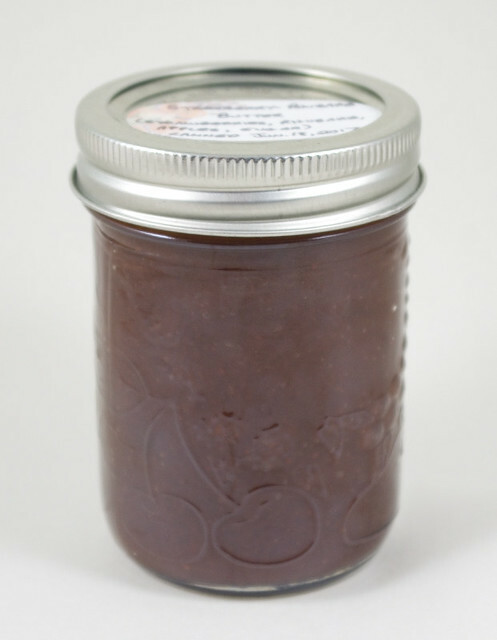 Simmering off the water increases both the flavour and the acidity, so fruit butters need less sweetening for taste or for preservation purposes. Fruit butters are a simple, wholesome kind of preserve that historically, in Canada, was a common way to make fruits last the winter. These days, they are made and eaten all year long, although most home canning happens in the summer and early fall when fruits are freshest and at their most plentiful. Contrary to what the name may indicate, fruit butters actually don’t usually contain any dairy products, although some recipes call for a dollop of butter to prevent frothing (which I usually forgo and instead skim the froth). They are generally vegetarian and can be made vegan through proper sourcing of ingredients — as I’ve previously mentioned, some varieties of sugar use bone char as part of the filter process, so if that’s important to you, you’ll have to do your homework when choosing a brand to buy. Strawberry-rhubarb butter will last up to a year when properly canned. Strawberry-rhubarb butter is the latest fruit butter I’ve made, and I’ve found that it perfectly encapsulates the tastes of late spring/early summer. Since the ingredients cook down, it’s a great way to use up rhubarb — especially if you’re searching for ways to use the stalks from an over-producing plant! I prefer to cook it in a combination of the microwave and the crock pot, because both are less prone to burning than cooking on the stove. 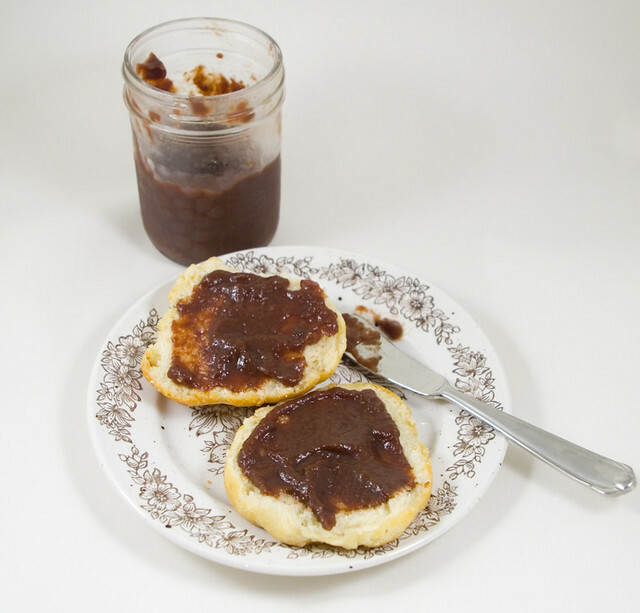 The quickest way to ruin a batch of fruit butter is to scald it; you’ll never get rid of that burnt taste. If you choose to cook on the stove, you will have to watch your ingredients like a hawk, stir constantly, and adjust your cooking times. For these reasons, if you have a microwave and a crock pot, I highly recommend using them. Strawberry-rhubarb butter on Dad’s biscuits. Cover and microwave in 3-minute increments, stirring every time you check for doneness, until the rhubarb are falling apart (approximately 15 minutes). Set rhubarb aside. While apples are cooking, put the rhubarb and its cooking liquid into a blender and blend until smooth. Pour rhubarb puree into crock pot. Repeat puree step with strawberries and their cooking liquid, and when they are cooked, the apples and their liquid. Stir until all elements are well combined. Set crock pot on high and cook until resulting butter is a little bit thinner than the desired final product (fruit butter will thicken slightly as it cools). This usually takes between 24 and 48 hours. Cooking more than 48 hours is not recommended as the butter will develop a burned taste. If fruit has not thickened enough after 48 hours, finish the thickening process on the stove top, stirring regularly to prevent scalding. Fill 250mL jars leaving 6mm head space. Process in a hot water canning bath for 30 minutes after the water returns to a boil. This fruit butter will last up to a year when processed. Alternately, the butter may simply be refrigerated for up to three weeks, or frozen (leaving additional head space for expansion) for up to six months. Posted on June 23, 2017 June 23, 2017 by owntwohandsblogPosted in Cooking, RecipesTagged butter, fruit, fruit butter, preserves, recipe, rhubarb, spread, strawberry, summer, vegan, vegetarian.